Joel became interested in magic at the age of six when a magician at a school assembly chose him from the audience to assist on stage. Since then, Joel Ward has taken his magic very seriously. A California native raised in Cardiff by the Sea, he started his own business at age 10 performing at children’s birthday parties. By age 15 he was a World Champion Teen Magician, placing first at the annual competition of the International Brotherhood of Magicians (the world’s largest magic organization). That same year Joel was picked from hundreds of magicians to appear on television with Master Magician, Lance Burton. The show, “Lance Burton – Young Magicians Showcase,” was filmed at the Monte Carlo Resort and Casino in Las Vegas. Joel currently performs hundreds of shows a year. He appeared on NBC’s “The Bonnie Hunt Show,” and was part of the series called “Masters of Illusion” on My Network TV. He also headlined the Ringling Bros. & Barnum & Bailey Circus show “Boom A Ring,” which toured the East Coast and Puerto Rico in 2009. 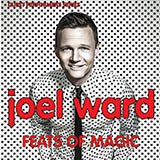 In January 2011 Joel made his first appearance on “The Tonight Show with Jay Leno” and on Comedy Central’s “Tosh.0.” Joel Ward currently lives in Los Angeles and performs for national television broadcasts, corporate clients, casinos, cruise ships and more.